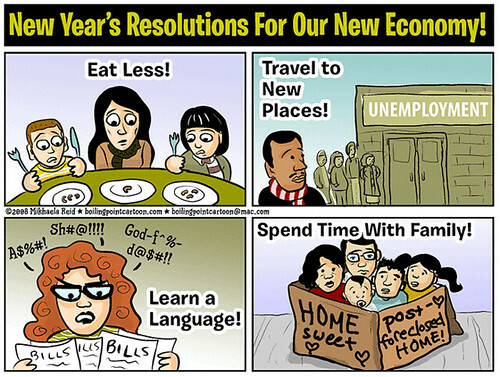 Boiling Point Blog: Feminist, LGBT and progressive political cartoons: Toon: New Year’s Resolutions For Our New Economy! This is a little poke at the columns and articles and such that have been praising our crappy economy for making Americans rethink their consumerism and remember "what really matters", etc. Not that I'm not all for an anti-consumerist wakeup call, but... is that really what's happening? Meanwhile, people on the margins will be making do with a weekend at the homeless shelter. Gack! The NYT is never more annoying than when its yupper-class bias comes out. The Hamptons for Christmas?!? Civilization is crashing; it's a veritable sack of Rome! Nice, punchy cartoon, Mikhaela. Happy New Year!